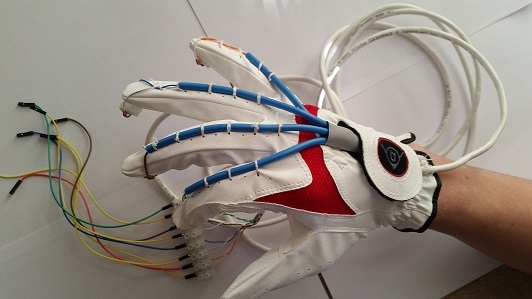 The Pi Glove is back! It was always the plan to develop the Pi Glove with 'modules' for various uses, starting with home assistance and sports. This module addresses the home assistance element of the glove's development. Image if you were or maybe do struggle with a disability and you awake in the night. The Pi Glove allows you to first check the time which is read out, a light can be turned on with a simple finger movement and if required an emergency text can be sent to a carer, family member or the provider of other medical assistance. The fourth button enables the Picamera which takes a picture of, for example a sign. OCR is then used to recognise and store the text , which is then read back to you. 31st January 2015: I decided to add the picamera back to the Glove but, placed it around the back of the hand area, this linked in well, enabling a more mobile use of the camera, it can now be positioned in a direction that the user wants, is more accessible and you could even take a selfie! The main reason for this change was to allow 'on the fly' optical charter recognition. I installed a Python OCR library and combining this with the image taken from the picamera, the software can identify the text within the picture. This text is then feed back to the console – easyspeak then reads out the text. I tried various file formats, JPG seemed to work well. Also, changing the picture to black and white to pick up detail and differentiate between the text had improved results. There were issues with it not identifying text in low light and also if the text was the wrong way round or upside down used. Finally, changing the saturation and increasing the sharpness produced usable results. 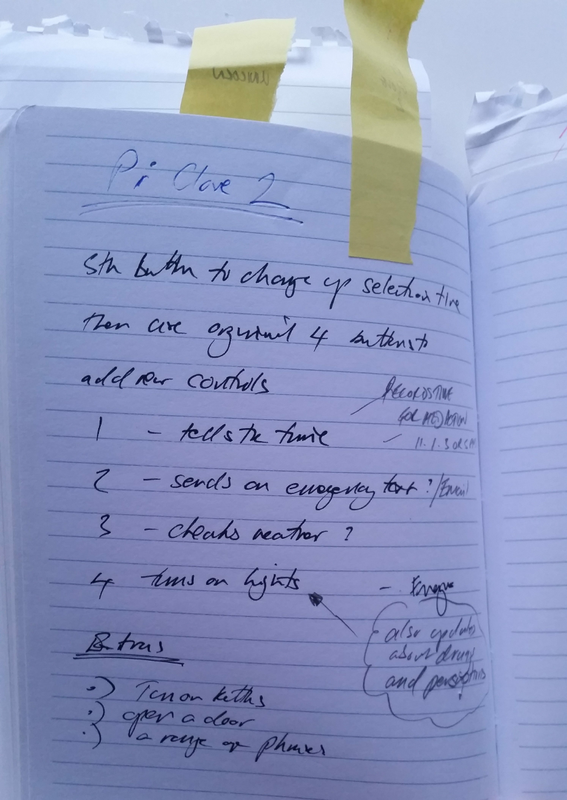 27th January 2015: The second button to test was the 'Lights On' button, this turns a lamp on, imagine it was dark and you woke up disorientated. You have a disability so find it hard to move to turn a light on. However, a simple finger movement and click of the Glove and the lamp is turned on. This failed first as the GPIO pin 17 used on the Glove is also required by the Energenie hardware to control the lights. I tested several other Pin numbers and they worked. Basically I could not use the original GPIO pin 17 and used another instead. Finally I added the SMS functionality to the third button and tested it. All three buttons and functions are working. See the sneak peek video opposite for the Glove in action. 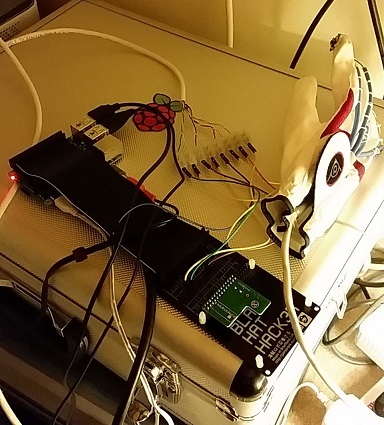 26th January 2015: Transfer worked - Glove now on new Raspberry Pi B+ model. I had to install more libraries, I realised I had not installed the Python libraries. I tested the old social glove code and it worked. Next up I connected the HACK HAT and the the first wires to the GPIO pins for the 'time' function. This throw up an error message as I had also called the definition / function time. I renamed it time_response and it worked. Press button one on the Glove and it collects the current time and reads it out. 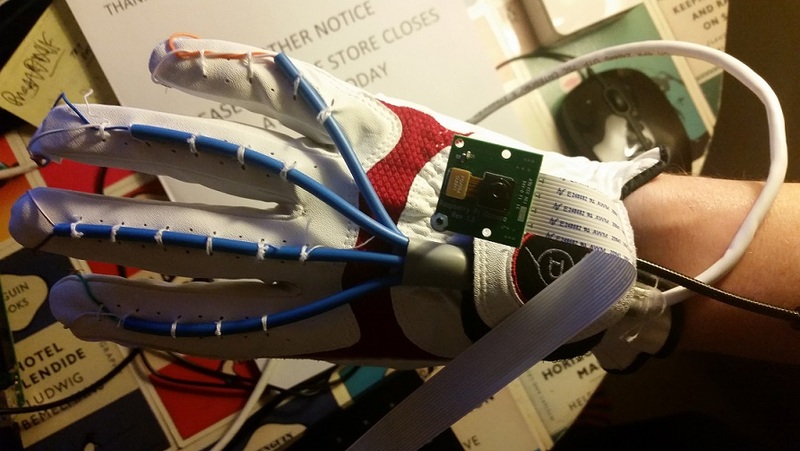 25th January 2015: Once all the test programs were functional I required more GPIO pins to connect the Glove's wires and the various hardware. 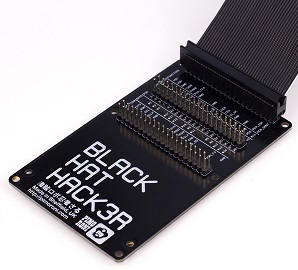 This was easily achieved via Pimoroni's Black HAT Hack3r. This can be used to extend the GPIO pins so that 80 are available. This introduce the next issue which was that the Black HAT is built for the Raspberry Pi B+ model and the original Pi Glove was built on model B. I needed to transfer the OS onto a new micro SD Card. I looked at many methods such as reading the card and then writing to another. In the end I opted to start with a fresh image, this required all the previous libraries to be installed, I made a long list! Once installed I copied over the Pi/Home folder from the original SD card, for this I used WinSCP. Now to test that the original Glove program functions correctly on the new B+ Pi. 22nd January 2015: The Emergency Text Response ETR makes use of Twilio web based communication API that enables the user to send a pre- written message requesting assistance. This could be adopted by others police / fire served in dangerous situations. The current time is also added to the text. 18th Jan. 2015: Lights: These are controlled using Energenie's power sockets. A full write up of this code is available here. Basically the code responds to a button being pressed and turns the light on. A second click will turn the light off. 16th January 2015: Time: The current time is captured in a variable using the code, current_time = (time.strftime("%H:%M:%S")) then it is printed to the console window with print current_time. Espeak is then used to read out the time. Basically the first button returns the current time.